Supply chain disruptions are increasingly caused by growing global supply sourcing, complexity, and interconnectedness of supply chains (SCs). 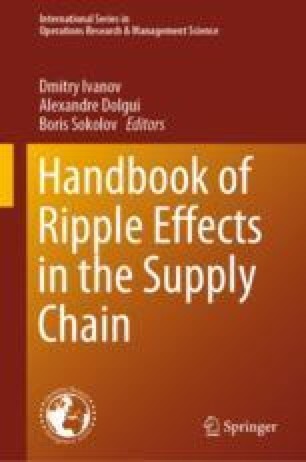 A key challenge in the context of supply chain disruption management is to control and monitor the ripple effect of SCs. The ripple effect occurs when the impact of disruption cannot be localized and propagates throughout the SC. Like the bullwhip effect, the ripple effect can negatively impact performance both upstream and downstream of SC entities. This work proposes a new methodology, based on a probabilistic graphical model, to analyze the ripple effect in a two-stage SC. The probabilistic graphical model developed is capable of capturing disruption propagation that can transfer from upstream suppliers to downstream end customer in an SC. Churshill, F. (2018). Automotive supply chain disruptions up to 30%. https://www.cips.org/en/supply-management/news/2018/june/significant-rise-in-automotive-supply-chain-disruptions/. Hosseini, S. (2016). Modeling and measuring resilience: Applications in supplier selection and critical infrastructure. https://hdl.handle.net/11244/44886. Ivanov, D., & Dolgui, A. (2018). Low-certainty-need (LCN) supply chains: A new perspective in managing disruptions risks and resilience. International Journal of Production Research. https://doi.org/10.1080/00207543.2018.1521025.